ICEfaces 4, ACE and MOBI input components. A great feature would be to support purely client-side validation when possible. This would be a great feature! But with JSF 2 we aren't using JSF validators anymore but only the more generic JSR 303 validators. It should also be possible to easily implement client-side equivalents for custom JSR 303 validators. Integration with *:ajax behaviours that have immediate=true needs to be handled by the component renderers. Having a generic solution is not possible in this case. Only the renderers know about what event types are available and how they match to the DOM events and elements. In that case let's prioritize the ace:pushButton and ace:linkButton for 4.1, and we can tackle the other components in a future release. 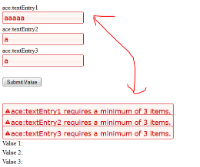 Ken Fyten added a comment - 15/Dec/15 10:24 AM Integration with *:ajax behaviours that have immediate=true needs to be handled by the component renderers. Having a generic solution is not possible in this case. Only the renderers know about what event types are available and how they match to the DOM events and elements. In that case let's prioritize the ace:pushButton and ace:linkButton for 4.1, and we can tackle the other components in a future release. Modified tabset client code to change tab's opacity only when submit is actually issued. Introduce new 'onsubmit' callback for ice.ace.AjaxRequest to allow for registering a callback that is invoked just before jsf.ajax.request function will issue the submit. ace:tabset remains incompatible with client side validators. As we're out of time for 4.1 we will remove client side validators from Emporium for this release and document this issue in a new JIRA (ICE-10894). Please revert the ace:tabset change noted above as well for 4.1 to reduce regression risk. Ken Fyten added a comment - 15/Dec/15 11:09 AM - edited Modified tabset client code to change tab's opacity only when submit is actually issued. Introduce new 'onsubmit' callback for ice.ace.AjaxRequest to allow for registering a callback that is invoked just before jsf.ajax.request function will issue the submit. ace:tabset remains incompatible with client side validators. As we're out of time for 4.1 we will remove client side validators from Emporium for this release and document this issue in a new JIRA ( ICE-10894 ). Please revert the ace:tabset change noted above as well for 4.1 to reduce regression risk. ICEfaces 4 trunk r46533 "Implemented integration with 'immediate' submitting components." is verified. Liana Munroe added a comment - 15/Dec/15 11:11 AM ICEfaces 4 trunk r46533 "Implemented integration with 'immediate' submitting components." is verified. r46537 - Reverted to normal server side validators in Emporium until ICE-10894 is fixed. Carlo Guglielmin added a comment - 15/Dec/15 11:34 AM r46537 - Reverted to normal server side validators in Emporium until ICE-10894 is fixed. Lack of support for using client validators with ace:ajax and "immediate=true" is captured in ICE-10897 as a future improvement. Ken Fyten added a comment - 16/Dec/15 9:40 AM Lack of support for using client validators with ace:ajax and "immediate=true" is captured in ICE-10897 as a future improvement. Marking Resolved.